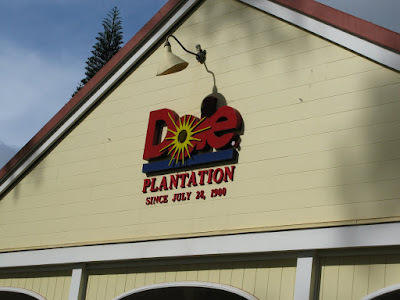 A common tourist attraction on Oahu is the Dole Plantation. Here you can take a train ride and learn about pineapples and pineapple farming, or find your way through the worlds largest maze. For us, it is the best ice cream shop. Before sampling the great treasures inside, we walked around the courtyard where there were many types of pineapples from all over the world. 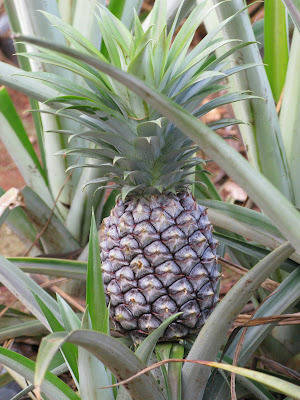 One interesting thing about pineapples - they look the same from the time they blossom to the time of harvest (18 month later!). 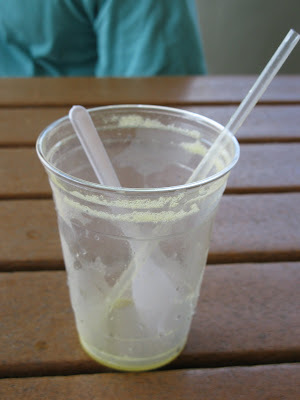 This is the goodness we came for - pineapple sherbet (they call it pineapple whip) in pineapple juice. Mmm Mmm Mmm! A few seconds later, it looked like this. 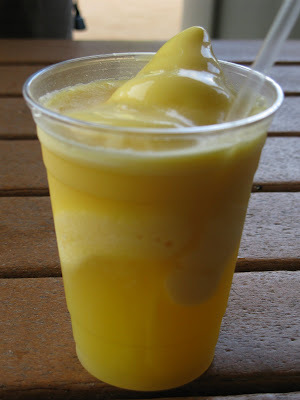 If you don't have time for the train or the maze, make time to get one of these (or any version of the pineapple whip!). 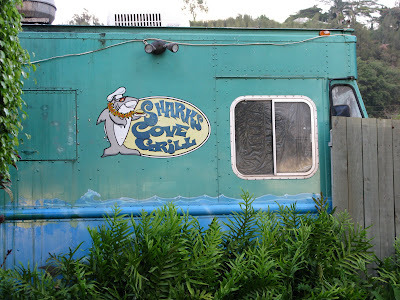 It's funny, in Hawaii - half the restaurants are placed inside of a truck. And surprisingly enough - they are some of the best restaurants. This is one of the first we went to. 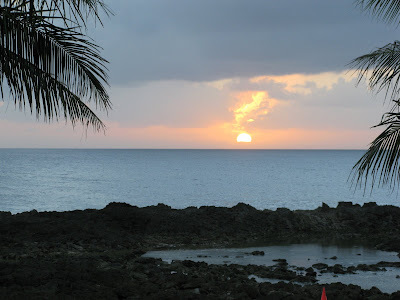 Everything in Hawaii is very relaxed, laid back. Get your own silverware, condiments, and water. Everything on the menu is delicious. I got a skewer of teriyaki chicken and one of shrimp. I am sorry I didn't get a picture of it... I ate it quickly and then gasped that I forgot to include you in the experience! Oh, and the best part - the view! 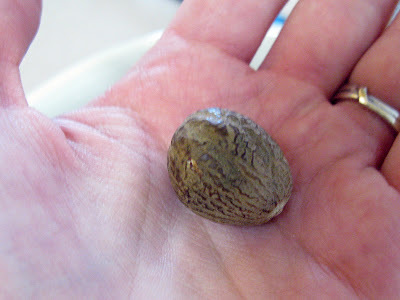 I learned a couple things about our friendly jalapeno that I thought I would share with you. 1 - As you probably know, the heat lies in the seeds and in the ribs. Remove those to make a more mild salsa. 2 - Do not use your hands to remove the seeds or ribs. I don't think you need gloves, these peppers aren't that hot, but use a spoon or your knife. 4 - (This one I figured out myself - its the best!) To remove the oil from your hands, if washing doesn't work, soak a cotton ball in rubbing alcohol and rub the area. The alcohol removes oil! Isn't that awesome? That's my culinary experience mixed with my nursing knowledge! Try it! Hey, someone let me know if it works with onions or garlic! Well, yet again, on vacation - but I will do my best. This time we are in Hawaii visiting my parents. What's to come: Restaurant adventures, tropical fruits, and maybe some Hawaiian-inspired recipes! Yesterday my husband finished his last final for his undergraduate work! Wahoo. So as a reward I made him his favorite dessert – Apple Crisp. He loves the topping so I doubled it for his special treat. The following recipe is the original, double the topping if you would like. * You can use any type of apples you would like. I think Granny Smith are a perfect blend of holding their shape, having a slight bite, but still be soft like my husband likes. Preheat oven to 350 degrees. Lightly butter an 8-inch square or 9inch round baking pan. 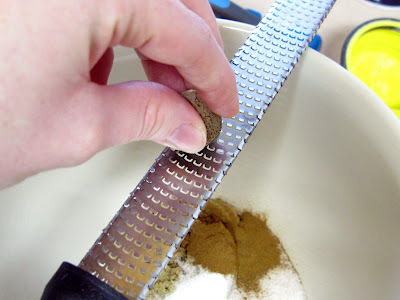 To make the topping, in a bowl, stir together the sugars, cinnamon, nutmeg, flour, and salt. Using a pastry blender, fork, or your hands (my favorite), work in the butter until all the ingredients are well blended but not overmixed. (If using your hands work fast and don’t overmix is really important because you don’t want the warmth of your hands to melt the butter or cause a gluten to form from the flour.) Refrigerate until ready to use. make it all pretty so people reading your blog are very impressed, realize that you still have half the apples to fit in, prepare a new pan, and just throw all the apples in. 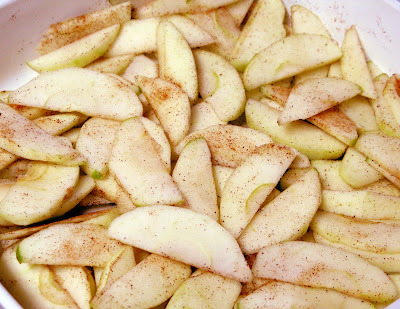 toss with cinnamon, and spread evenly. Drizzle the water evenly over the apples. 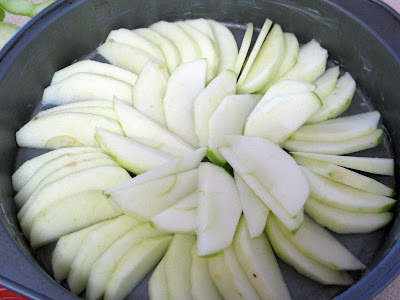 Bake the crisp until the topping is brown and crunchy and the apples are tender, 25 to 30 minutes. Serve hot, warm, or room temperature. Top with ice cream, whipped cream (my favorite), or half and half (my husband’s favorite). My sister, Hannah, is amazing. She is a woman of many talents. One of her talents is graphic design. She has always had a talent for design, but learned the programs to facilitate her designing from a friend after she graduated in school. She also has a talent of knowing me well. Thanks for putting those two talents together and designing a beautiful blog for me! Your the best!! I first must preface this post by saying that the family I was raised in was very big on food. For example, one day my aunt said, "We shouldn't put so much emphasis on the food." And my mom thought, "That's blasphemous!" (It was.) We love food. We must eat three meals a day plus snacks. 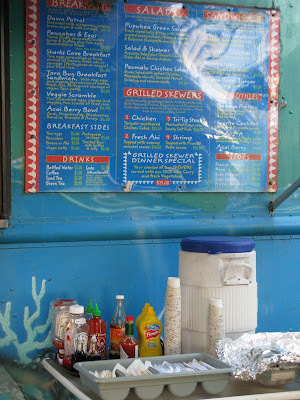 When we travel we think of all the great restaurants and different foods we will try. That is where we get our jollies. So, this last week I traveled with my father-in-law and baby to Texas to visit my sister-in-law and her family. We left for the airport at 10 am, flew out to Denver at noon. We had a little bit of a layover - it was about 1:30 in the afternoon. My thoughts, "lunchtime!" I didn't want to mention it because I didn't want my father-in-law to think I wanted him to buy it for me, and because I thought "he must be hungry." Nope. 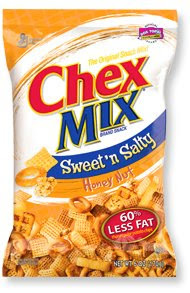 So I got out my "snack" and ate almost the entire bag of my sweet and salty goodness. Well thanks to good ol' Southwest we had a stop in Amarillo and didn't arrive at our destined Dallas until 6:45. We were the last plane to land and the airport was closed. So, we had to sit in the baggage claim area for over an hour while we waited for the thunderstorms, lightning, and tornadoes (yes, tornadoes) to pass. We were walking out of the airport close to 8:15. Bless my 8 year old niece who was saying she was hungry. Well, the airport we landed in was fairly small and the only thing that was open was Chili's - we didn't want to wait that long - and Cinnabon. We took a box of 6 cinnamon rolls and ate them in the car. Seriously, that's what my meals consisted of - Chex Mix and cinnamon rolls. Thankfully when we got home the lasagna had been put in the oven a while before the power went out and had finished cooking. So we ate in candlelight while we waited for the tornado power-outage to resolve. What an adventure! Things I have learned: when traveling with the in-laws, bring food (or speak up like cute niece!). My mother-in-law has the worst knifes ever! Literally - she will admit it too. It takes three times as long to cut something with her knives than with mine (thanks Mom for the great gift!) I was inspired for this post by her - she finally bought a new set and cutting boards. I thought I would let you in on the secrets to knife care that I have learned over the years. 1 - You don't need lots of knives, or even spend tons of money - but it is worth the investment to have one good sized knife that is sharp. I have these and love them. 2 - The handle should be heavy. This tells you that the blade of the knife and the handle are one piece. That's a good sign. Also a good sign is if the handle is wood, you can see a metal stripe all the way to the base of the handle. (I would recommend a handle that can go in the dishwasher though. 3 - I know what you are thinking, "You can't put good knives in the dishwasher! It dulls the blade!" False. You can put them in the dishwasher. I did some research - it only damages the blade if it is near metal and bangs up next to it. So keep it away from some of those utensils and other knives. 4 - Paper or Plastic? Both! Boards that is. (Well, not really paper - wood.) Your cutting boards should be made of one of two things - Wood or Plastic. Plastic for raw meats, wood for everything else. If you have a good butcher block that is treated well, juices, oils, etc., should not leak through. No glass. None. No acrylic. Throw them away. I don't care how cute they are. * Your butcher block should be at least an inch or two thick. That way you can sand it and treat it when needed. We will talk about butcher blocks another day. 5 - Do not use that "knife sharpener" that comes with your knife set. That is a wet stone and only really fancy chefs and other knife professionals should use these. If you use it and just the wrong angle, it will damage your knife. Use this beauty I bought for me and my mom. We each keep ours near the knife block. We use it before every use. It is not a sharpener - but a honer. I learned most knives are really dull, they are just bent slightly. This fixes that. Plus! It's only $20! 6 - Love them. Cherish them! Do not use them to open boxes or for sword fights. Just food please. For St. Patrick's Day one year, my sister and I decided to make Irish stew and soda bread. It was delicious. 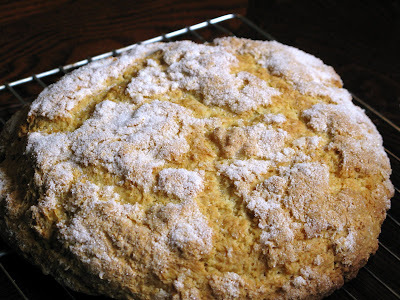 We had never had soda bread before. It quickly became a tradition. For some reason whenever I see buttermilk, I think of this recipe. It was on sale this week, and although we are past St. Patrick's Day, I had to make it. Preheat oven to 375°F. Spray 8-inch-diameter cake pan with nonstick spray. I used a 9-inch because, well, that's what I have. 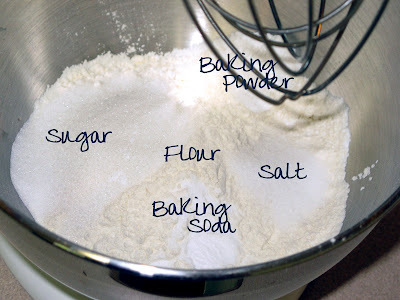 Whisk flour, sugar, baking powder, salt, and baking soda in large bowl to blend. Add butter. Using fingertips, rub in until coarse meal forms. Add buttermilk. Gradually stir dry ingredients into milk to blend. Mix in raisins, if desired. I didn't today. 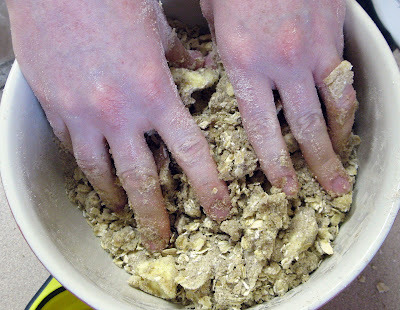 Using floured hands, shape dough into ball. 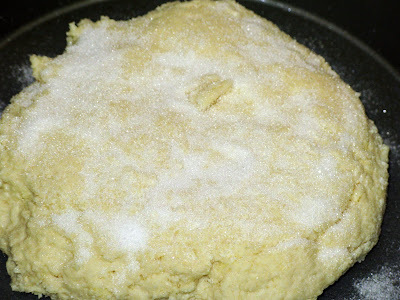 Transfer to prepared pan and flatten slightly (dough will not come to edges of pan). Sprinkle dough with 1 tablespoon of sugar. I know, I have a weakness for anything with sugar, so this got a little more than a tablespoon of sugar. Bake bread until brown and tester inserted into center comes out clean, about 40 minutes. Cool bread in pan 10 minutes. Transfer to rack. Voila! Serve warm or at room temperature. I am not huge into many gadgets in the kitchen - especially those that only do one job. 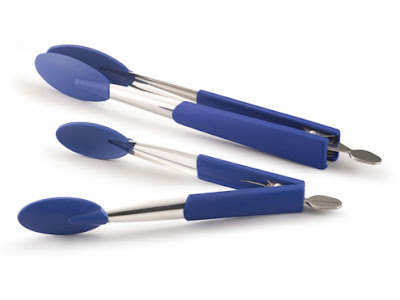 They are great tools - but for those who don't have the biggest kitchen to store them, or the best memory to remember how to use them or where you keep them - they just aren't for me. I say give me a sharp knife and a spoon, and I am good. I use my tongs a lot but noticed that I couldn't use them to scrape the bottom of the pan when deglazing a pan, I couldn't be too aggressive with my metal tongs on my new non-stick lovlies. These tongs are perfect! With the silicone heads I can protect my pans while tossing my pasta, making a sauce, or serving a salad. I love them! I love pork chops. It is just a nice alternative to the everyday chicken breast. But I try to think of different ways to dress it up so that it is not the same old pork every day. Today I had some mangoes that I needed to use. So I made a pork chop, seasoned with just salt and pepper, then topped with this mango salsa. It was delicious. These are all estimates of the amounts I use, I just adjust to what I have on hand, how it tastes, and how it looks. This is great for any protein: chicken, fish, pork. Also great alone with chips! If using this to top a protein, don't test with tortilla chips (my usual way of testing salsas) because the salt from the chips may throw off your need for seasoning. I work night shifts at the hospital, and sometimes Labor & Delivery can get pretty busy - especially in the summer. So one day this week we decided to do a potluck dinner. This way if it is really busy and we don't have time to go down to the cafe to get something, it is there for us. This week, it was on the perfect day. I was in charge of dessert and my mom and I have been talking about these cookies for a while. In the bowl of an electric mixer fitted with a paddle attachment, mix together the butter and sugar until they are just combined. Add the vanilla. 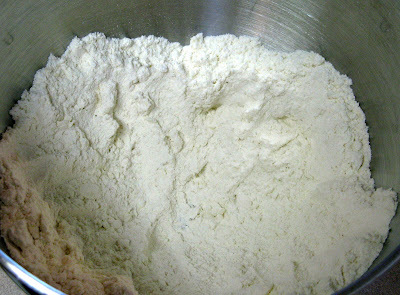 In a medium bowl, sift together the flour and salt, then add them to the butter/sugar mixture. 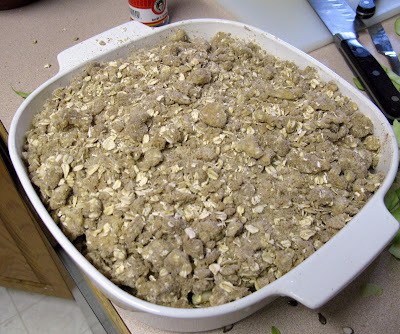 Add the pecans and mix on low speed until the dough starts to come together. Dump onto a surface dusted with flour and shape into a flat disk. Wrap in plastic and chill for 30 minutes. 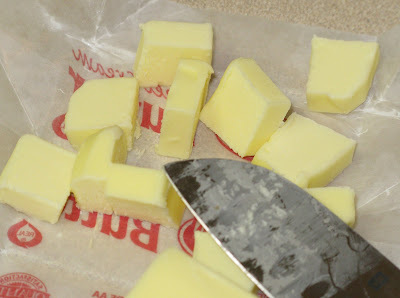 Cut into 2 1/2-inch squares with a plain or fluted cutter (or cut into any shape you like). I didn't have a cookie cutter other than a heart so I decided to use my handy pizza cutter. Place the cookies on an ungreased baking sheet. Bake for 20 to 25 minutes, until the edges begin to brown. Let cool completely before eating. I know, this is hard - but trust me, they are one of the few cookies that are better room temperature. I decided to double the recipe - some for work, some for my mom. So with the second batch I decided to roll it into a log and chill that way. Once it was chilled I cut it into 1/2 inch slices and baked as above. Either way works, the dough needs to be well combined for the log - or else it will crumble as you cut it. Delicious! Once cooled, eat before someone else does! 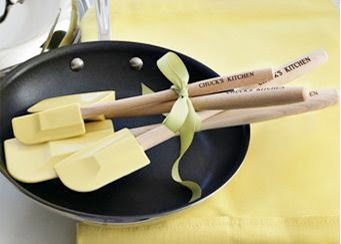 I saw these today on Williams-Sonoma. I would really love them. I just like the idea of something personal and clever on something simple, like my favorite spoonula. The red would go great with my kitchen, but the pink are so cute. How will I ever decide? Maybe my husband can get these for me for our anniversary. I also might get this to go along with it! I just finished a very funny book by Fannie Flagg, "Can't Wait to Get to Heaven." 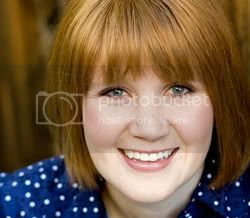 Fannie Flagg is the author of "Fried Green Tomatoes at Whistle Stop Cafe." This is a very funny book about a Elderly lady, Aunt Elner, who dies, goes to heaven, and comes back to life only wishing to be back in heaven. This is a fun, touching story portraying the effect one person can have on a whole community (or even the world). While in heaven, she sees an old friend Dorothy who gives her the most delicious Caramel Cake. Lucky for us, Fannie Flagg gave us the recipe! So, I thought I would try it out. Beat for 3 minutes. Bake in greased pan for 1/2 hour. 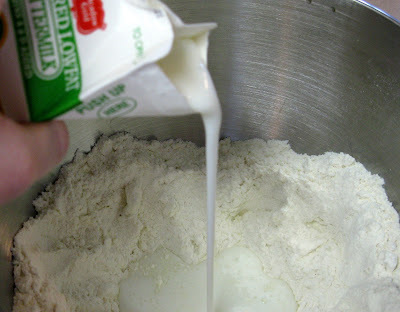 Mix cake flour and milk. Cook to a thick paste over slow flame. Cool. Cream sugars and vanilla with butter and shortening. Beat until light and fluffy. Blend in salt. Mix in cooled paste. Beat until fluffy. Blend. Should look like whipped cream. 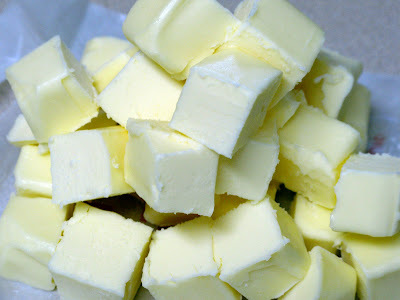 I would not put in shortening and do all butter - it would make a richer, better flavored frosting. If you don't have cake flour you can use this recipe to save yourself a trip to the store. My mom used to make oven "fried" chicken for us when we were kids. I just put a little spin on it, making it into chicken strips rather than whole chicken breasts. This is a great healthy alternative to the fast food or even store bought chicken nuggets - where you don't know what part of chicken you are eating. In a Ziplock Bag mix cornflakes and your favorite seasonings. I added dried parsley, garlic powder, salt, pepper, and a dash of cayenne. Seal the bag and whack away - kids love to help at this part! You could also add parmesan cheese, onion powder, curry powder, cumin, or whatever flavor you are in the mood for. Prepare your assembly line - egg wash, corn flake mixture, chicken breasts cut into strips, and a cookie sheet with a cooling rack inside. Wipe the chicken with a paper towel to make sure the wet mixture sticks well. Dip into egg wash, cornflakes, and then onto the cookie sheet. The egg wash is just a couple eggs with some milk, salt, and pepper. You could add hot sauce if you wanted it to be more spicy. You could replace the egg wash with plain yogurt or milk alone if you wanted to cut the calories. Place on cookie sheet and put in a 400 degree oven for 6-10 minutes or until cooked through. By placing on the rack the air gets all around the chicken. No need for flipping. If you don't have one, line the cookie sheet with parchment paper and flip the chicken half way through. You can spray with a little cooking spray for a more browned color. Eat before someone else does! Great with your favorite dipping sauce - honey mustard, BBQ sauce, ranch dressing, or honey. This is the bread crumb mixture. This is the cornflake mixture. My verdict? The original was much better. The bread crumb mixture needed something a little more - we will see what we can do with it.